Last year’s awesome Marvel movie Black Panther put Afrofuturism center stage, delivering a universe of hi-tech sci-fi wonders imagined through the prism of African culture and tradition. What Black Panther did for the world of films and comics, BOAA aims to do for videogames. This innovative top-down action-platformer is a “comedic space opera” set 3500 years in the future. In the words of developer Illuminia Studios, it’s the first ever tectonic top-down space hopper. BOAA stands for Bounty On An Asteroid, and that neatly sums up the premise. You play as a bounty hunter in space, hopping from asteroid to asteroid in an attempt to avoid plummeting into the endless frozen void. Not only do you have to ensure that you’re standing on an asteroid, but you need to remain inside the playing area too. Fail to do either and you lose a life. To jump to an asteroid you aim a beam at it, which is a bit like using the teleportation mechanic in Dishonored. You can fire, too, shooting asteroids out from under the feet of your hapless enemies. BOAA is still in Tech Demo (pre-alpha), with the 0.3.2 update adding three new game modes to the work in progress: an arcade-style endless mode, 1v1 local multiplayer, and a progression mode that gradually ramps up the difficulty over 25 stages. Eventually there will be four worlds, each containing four level sets with their own sub-levels, adding up to a hundred different scenarios. But before then Illuminia Studio is adopting an open development policy and inviting as many players as possible to have a go on the tech demo and give feedback. 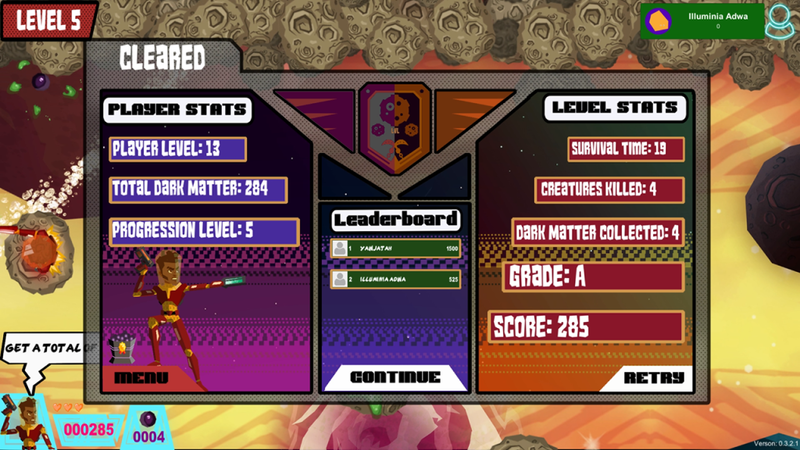 So if you want to see your ideas come to life in an exciting new Afrofuturist action platformer, this is your chance. Read more about BOAA here, and you can download the tech demo here too. The post BOAA is a cool-looking Afrofuturist platform game, and you can help make it appeared first on Droid Gamers.